Enhance your vehicle’s interior by restoring damaged leather and plastic surfaces. 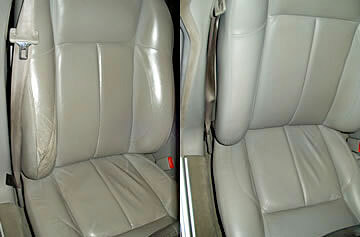 Wilde Bodyworx repairs and restores damaged leather and plastic materials for far less than replacement cost. If your vehicle’s interior surfaces are faded, cracked, ripped, stained, or otherwise damaged, you will be amazed at the results of our interior repair processes. Leather restoration removes years of wear, and it contributes greatly to the appearance and value of your vehicle. Our leather reconditioning technicians have the equipment and expertise to make interiors look new again. Our restoration is a cost-effective alternative to expensive replacement.